Learn about the five emails you need in your offer funnel to convert leads and increase your bottom line. It’s not enough to make a website, choose a pricing model, put your feet up, and wait for your visitors to convert into customers. Your visitors aren’t going to automatically turn into new or repeat customers without a little nurturing. You have to create high-value conversion funnels that nudge your leads along the customer lifecycle. Successfully moving your leads through this requires nurturing. One way to acquire prospects is by offering them free, gated content in exchange for their email address so that you can stay in touch until they convert into paying customers. Once they’ve made their way through the funnel, your core product will look more enticing, even at a higher price point. 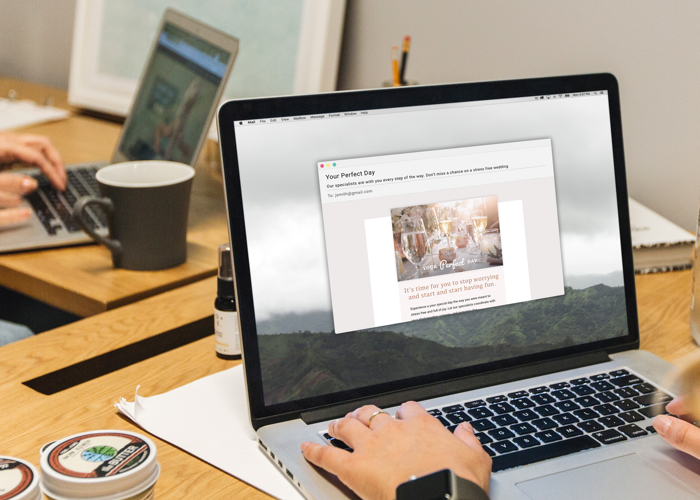 In the Convert stage of the customer lifecycle, your offer funnel ties the content intended to bring in prospective customers to your main product. Commonly, offer funnels feature five emails that nudge each contact toward purchasing one of your products. Space these emails a week apart to remain relevant while not pestering your leads. We’ve outlined these five offer emails with examples of content that resonates with your prospects. Delivery Date: Your first email should fire the day after your customer purchases your entry-level product, and there should be a week between each of following emails. Angle: Each email should take a separate angle to appeal to your prospects’ different emotions and desires. Email Subject Line: This should grab your readers’ attention, but make sure it accurately represents what’s inside the email and is not deceptive. Email Pre-Header: Back up what you’re saying in your subject line with more information. A pre-header is the text that follows the subject line when your email shows up in the inbox. Greeting: If you’re using a CRM database such as Ontraport, use a merge field that autofills your prospects’ first name. Body: Keep your content concise, relevant and straightforward. Try to to limit your content to three paragraphs here. Any longer and your lead probably won’t read your email. Brevity is key. Call to Action: In your last paragraph, include a reminder or nudge about what you are promoting. Sign-Off: Be consistent in how you sign off your emails so your recipients will recognize you. P.S. : Some leads may only read your P.S., so make it enticing and not repetitive. This email should highlight how much recipients stand to gain from buying the product you are offering. 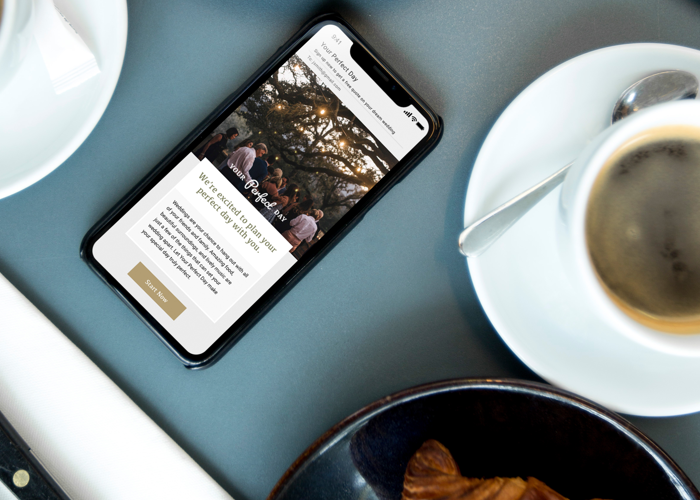 It’s meant to quickly paint the picture of what your contacts’ life is going to look like once they purchase your product, and it uses much more of an emotional appeal than subsequent emails in the funnel. Make sure it resonates with your customers’ desires and hopes for their future. Focus on what your contacts will gain if they purchase your product. This planner suggests a likely client pain-point (planning stress) and offers Sophia a solution: delegate wedding planning to her. She goes on to say that this will reduce her stress level and lead to a joyful wedding, something that resonates with the hopes of all brides-to-be. If this emotional appeal lands home, Sophia might purchase the tripwire product, in which case she’ll skip over the next four emails and go straight into the Fulfill funnel. If not, she’ll continue along the Convert funnel and receive the second offer email. Wait seven days after you’ve sent your first email to send the second. This time, the wedding planner will appeal to Sophia’s fear of missing out (FOMO) to persuade her to make a purchase. Remember, FOMO is different than striking fear into the hearts of your contacts. It’s easy to make this email inherently negative, so stay clear of negative messaging. Instead, focus on the undesirable outcomes that might occur if your leads don’t purchase your product. Urgency: Creating time constraints around product purchasing, such as flash sales. Scarcity: This incites urgency via a limited supply of your product, such as seats at a venue. Social Proof: Encourage past clients to leave reviews on social media. When prospects see that people are interested in your brand, they’ll wonder if they’re missing out. Exclusivity: Make your leads feel like VIPs by offering them something exclusive. Offering a sample of your product to a select few “beta testers” before it’s officially released could make a great trip wire. Experience: A high value is placed on experiences. 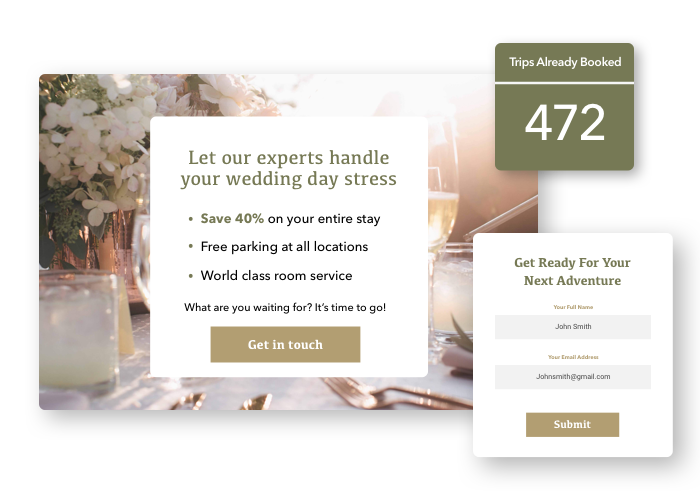 Sell the ideal experience your product offers, such as a stress-free wedding. Be genuine when using FOMO. Don’t create false scarcity, but if your product is scarce, tell your prospects. People don’t want to miss out on getting something they need. Including a time constraint adds a sense of urgency as Sophia knows if she doesn’t take the deal, it will disappear — no one wants to miss out on a bargain! Honesty pays off here as prospects will only take your deals seriously if your “limited time” offer is actually limited. DAY 14: OFFER EMAIL #3 – LOGIC Appealing to Sophia’s emotional side isn’t working. Now it’s time to back up your arguments with data. The third email satisfies your readers’ sense of logic by presenting the facts. Talk about the benefits of buying your product in a clear and rational way. Evidence: Provide quantitative data that highlights the success of your product or service. If 95% of your customers have been satisfied, your prospects will think they’ll be satisfied, too. Credible Sources: You may not be an expert, but you can share an expert opinion. Use recent studies from unbiased organizations and, when possible, link to original sources. If, Then: Explain how the solution to your clients pain points will follow the implementation of your product or service. Make it easy for your prospect to connect the dots. Both Sides: You might be tempted to ignore conflicting information. Instead, present opposing arguments accurately, and explain why they don’t apply to your product or service. 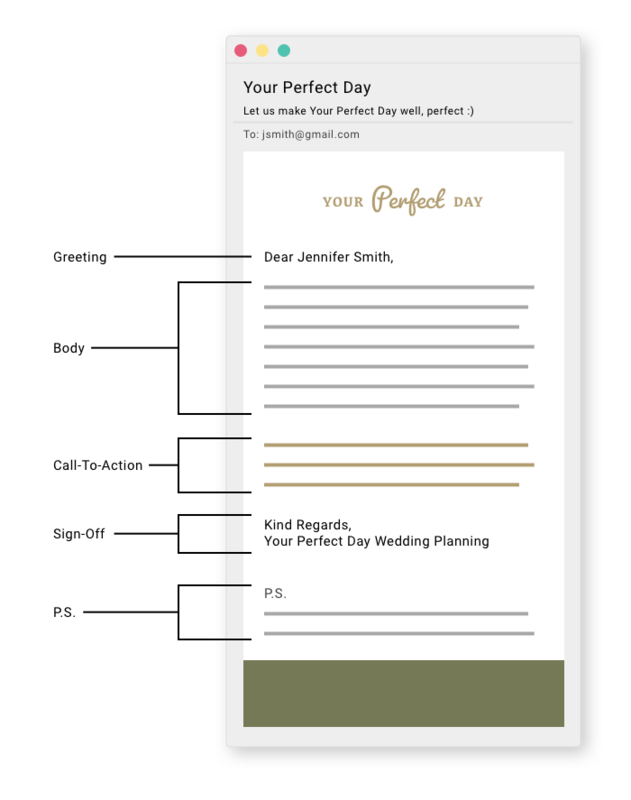 The wedding planner sends an email to Sophia citing data from a reputable source that shows how much time the average couple spends on planning their own wedding. Sophia’s time is valuable — she earns $40 an hour. If it takes 100 hours to plan a wedding and a wedding planner costs $1,000, then hiring a wedding planner would actually save Sophia $3,000! DAY 21: OFFER EMAIL #4 – ARE YOU STILL…? DAY 28: OFFER EMAIL #5 – HAVE YOU… YET? If somehow Sophia is still sitting on this great deal, then it’s time to send her the last offer funnel email. The final email of the funnel is a hard sell on your product. Similar to the email above, where you reiterate the problem they are dealing with, this one takes it a step further by pushing the problem harder. Ask recipients why they haven’t taken action yet and remind them of the urgency to respond to the offer. This is your last effort to convert your leads into customers, so emphasize why your product would make all the difference by using visual aids, testimonials and before-and-after stories. The wedding planner now sends a powerful, true testimonial from a past client who, like Sophia, thought she could do it all by herself and was nearly pulling her hair out by the time she hired the wedding planner to sort things out. The testimonial, when wielded wisely, is a crucial component to your convert stage and, as such, can make or break a sale. Ensure it’s a tailored solution to their problem. After you’ve made the connection between their problem and your solution crystal clear, tell your prospect exactly how to buy your service or product. Keep it as simple as possible with everything they need right in the body of the email. Happily, Sophia opens this last email and converts! With one click, she buys QC’s Deluxe Wedding Planning Package. She can sleep easy knowing that no bridezillas lay in her future. Once you’ve crafted your five offer emails, place them into your conversion campaign within your marketing automation platform, and watch your leads turn into customers. Have tips on writing email copy that converts? Tell us in the comments below.